Bulgur (also bulghur or burghul) is a cereal food made from several different wheat species, but most often from durum wheat. 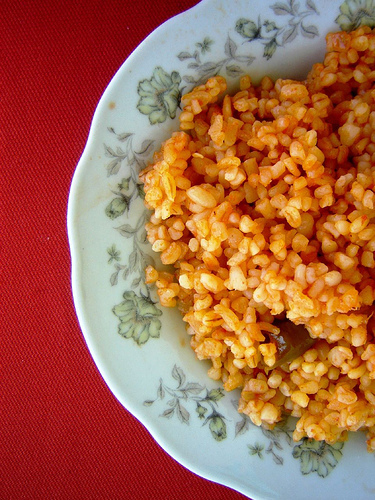 Bulgur for human consumption is usually sold parboiled, dried and partially de-branned. Bulgur is a whole grain. Bulgur is sometimes confused with cracked wheat, which is crushed wheat grain that has not been parboiled. Whole-grain, high-fiber bulgur and cracked wheat can be found in natural food stores, Middle Eastern specialty grocers, and some traditional grocery stores. Bulgur is a common ingredient in Turkish, Middle Eastern, Indian and Mediterranean dishes. It has a light, nutty flavor. In the United States bulgur is produced in four distinct grinds or sizes (#1 Fine, #2 Medium, #3 Coarse and #4 Extra Coarse grinds.) It can be found in both conventional and organic forms. 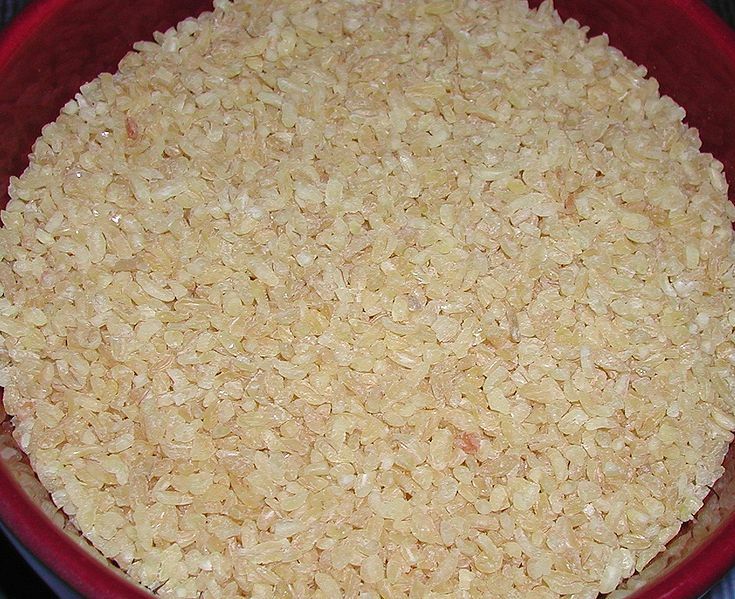 Bulgur can be used in pilafs, soups, bakery goods, or as stuffing. In breads it adds a whole grain component. It is also a main ingredient in tabbouleh salad and kibbeh. Its high nutritional value makes it a good substitute for rice or couscous. In Indian cuisine, bulgur or daliya is also used as a cereal with milk and sugar. In Turkey, it is prepared as pilaf in chicken stock, with or without sauteed noodles, or cooked with tomatoes, onions and red pepper. In Cyprus it is used to make koupes (also known as bulgur koftesi), a variety of kibbeh. It also forms the base of a soup, tarhana, which is made with yogurt to which hellim/halloumi has been added.